May 7th. Because I had no idea what I was doing the first time or two, and because I believed the marketing hype, the paint on the telescope "Sedona" didn't stick too well. I'll never trust 'primer and paint in one' again. 'Shampoo and conditioner in one' is as far as I will go from now on. I made that Celestron sticker from scratch (tracing over a picture of one of those stickers in a vector drawing program), but I didn't like the character spacing. See how the letters are kinda bunched up at the end? I laid out a new one and went to remove this old one. Like I said, shampoo and conditioner and that's it. Got all of the old paint removed by trying this automotive spray-on stripper. It didn't work well, either. 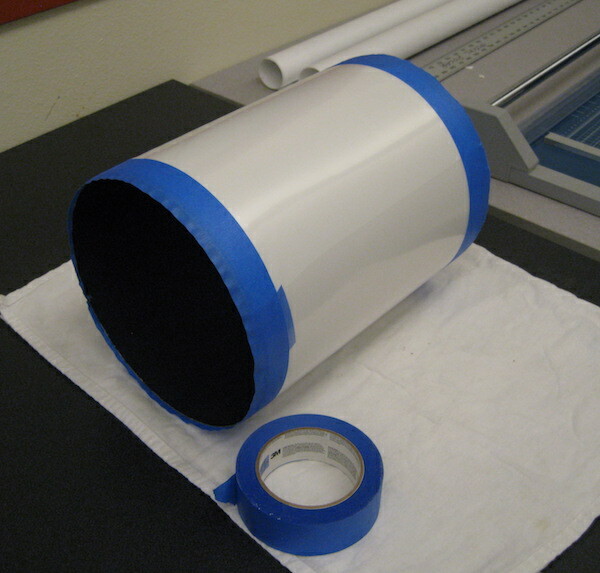 After three applications for just this simple coat of paint the tube still felt like there was a layer of wet, sticky paint on it. I resorted to good ol' StrypeEze brush-on stripper after this picture. That got rid of everything. I, again, decided to not strip and redo the inside of the tube. I'll touch it up with Rust-Oleum Chalk Board paint like last time once the outside paint job is finished. 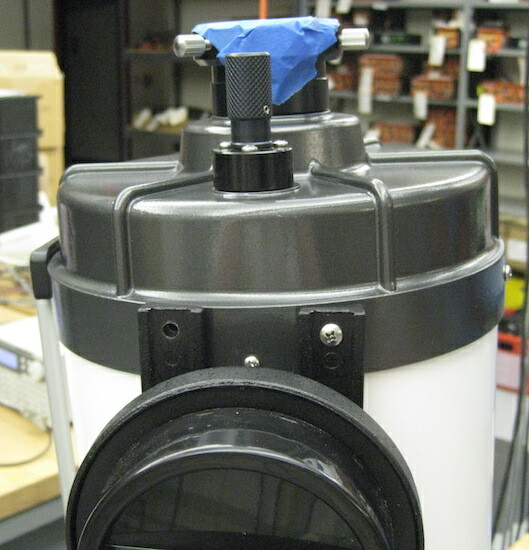 The other reason for taking the scope apart again was to fix up the mess on the primary mirror. The picture above has been fiddled with to make the streaks show up better, but the mirror was covered with streaks of Sharpie-like ink that got into the cleaning rag. Someone blackened the edge of the mirror all of the way around. I don't know if that does any good or not, but most of it is gone now, and that's the way I will leave it. The streaks could only be removed with alcohol since they were ink. They were everywhere, and, of course, couldn't be seen with the light of the room where I put the telescope together. With that light everything looked fine. The specks of dust are just photo-enhanced parts of New Mexico. 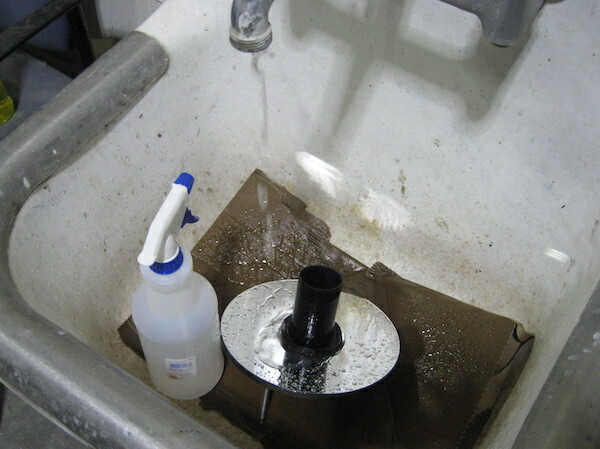 The spray bottle is filled with straight isopropyl alcohol. Hosing it down and rubbing off the streaks with my fingers was the only way I could think of to get them off. If I tried using a towel again I was afraid that more ink would just get into it from the edge of the mirror and it would be deja vu all over again. I cleaned and rinsed about four times. That seemed to finally get it all. There wasn't anything else that needed to be done with the mirror, so I put it back in the rear cell of the scope and put it all to the side to wait for the tube. May 22nd. After a busy couple of weeks of not working on this it was back to it. A kindly gentleman on the CloudyNights.com forums contacted me and gave me a recipe that he used for painting cars. Sounded good to me. 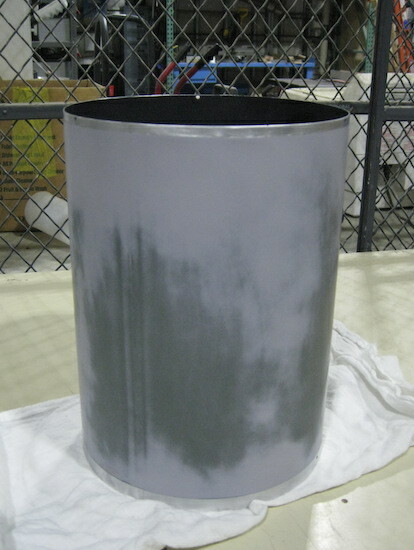 The process began with scratching up the metal with sandpaper. 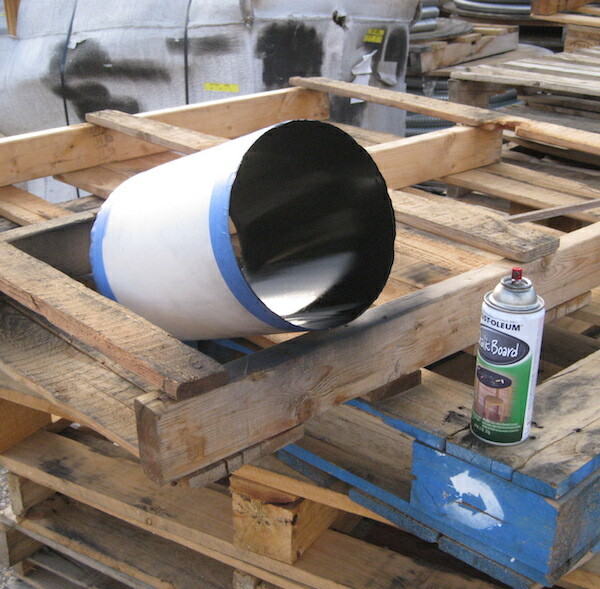 I wet sanded the outside of the tube with some 220 grit paper and then gave it a good washing. 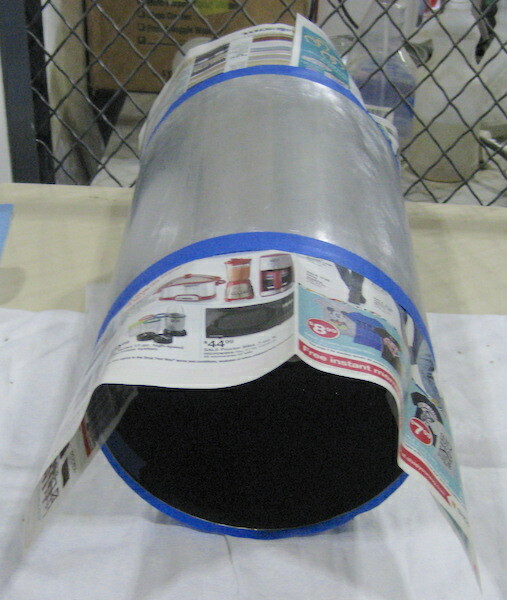 One end of the tube needs to have 1/4" edge of bare metal and the other a 1/2" of bare metal on the outside of the tube. I marked off the areas with a pencil and then ran 3/4" painter's tape around the outside circumference. To the sticky side that was left beyond the metal I stuck some advertising flyer paper. 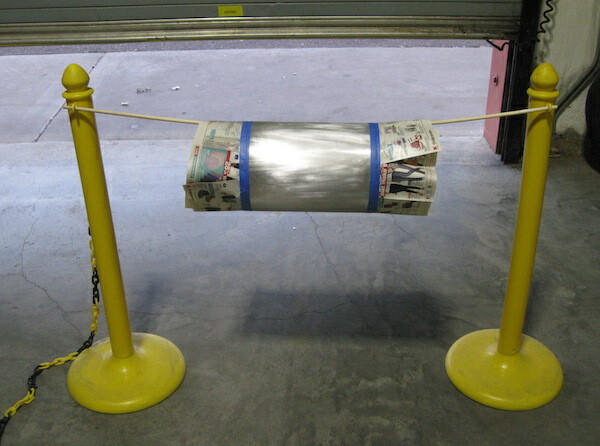 In our warehouse at work we've had these stanchions standing around doing nothing for years. I put them to work. I strung a dowel between them and hung the tube. 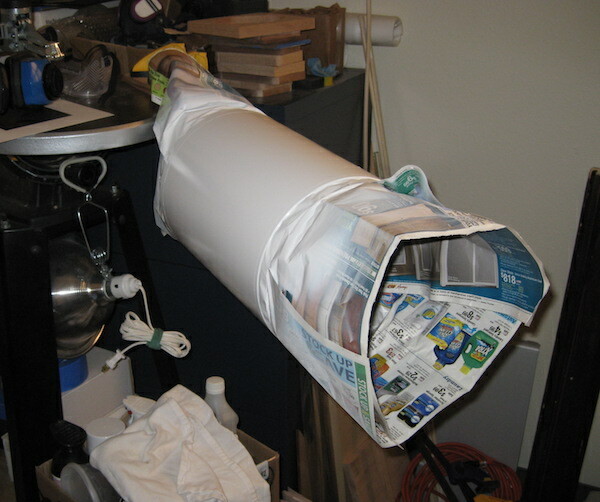 This allowed me to easily get at more than half of the tube before it needed to be rotated. To rotate it I just stuck my arms into the tube from each end and moved it. 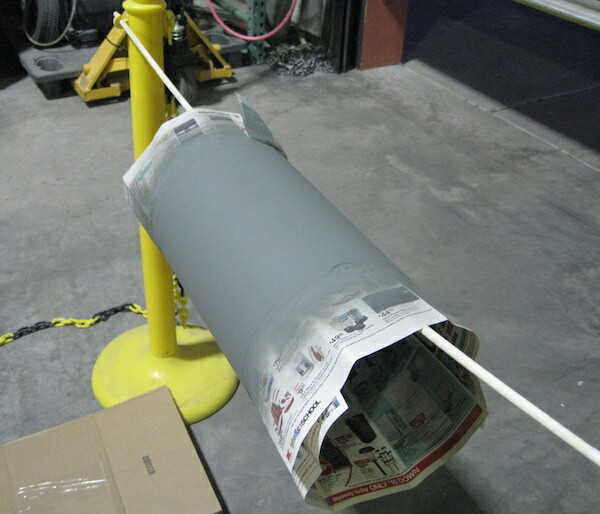 The paper out beyond the tube kept the exterior paint from getting inside and on the black interior paint. Not bad. 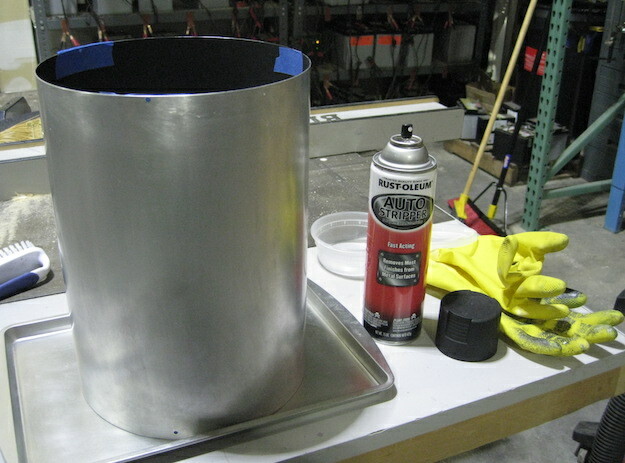 This was two coats of Rust-Oleum self-etching primer. I paused for about 1/2 hour between coats. A couple hairs of dust got in there, but there will be a sanding step coming up. This paint was pretty stinky. I usually put my projects in my office at the end of the evening, but this time I just hung it out in the warehouse on a stick to dry over night. I didn't want the janitor passing out when he came to empty the garbage can in the morning. 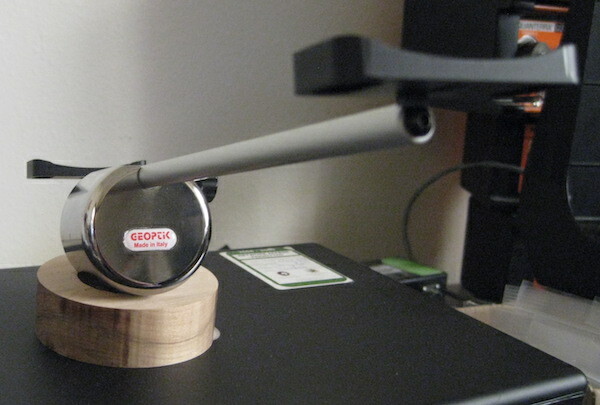 I saw a post in the forums about this counterweight device from Geoptik in Verona, Italy and decided to get one. I liked that the rod was close to the tube. 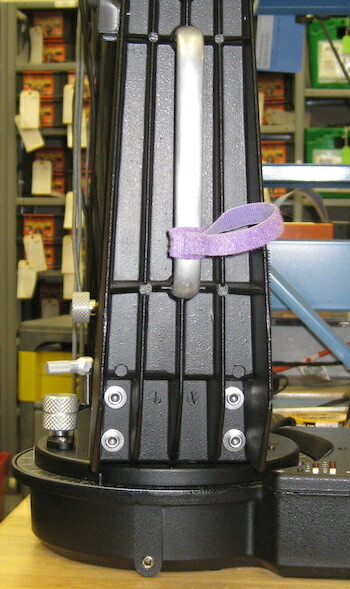 The stock counterweight sets have holes in the middle of the weights so the rods have to be fairly far from the tube. 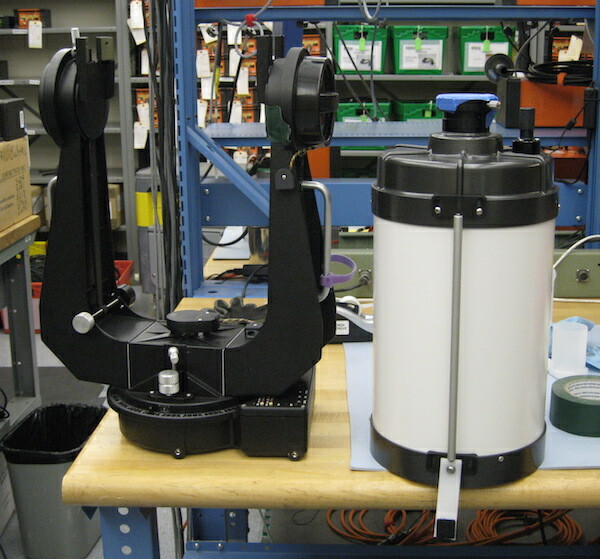 This one should stay out of the way of the azimuth encoder, though I believe I will have to rethink the plastic tongue (see) that uses the counterweight hole of the front ring. 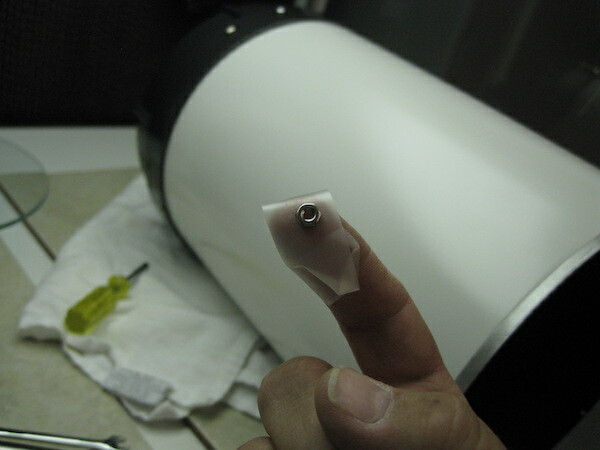 I will probably mount the tongue to the mount itself, instead of the front ring of the telescope. 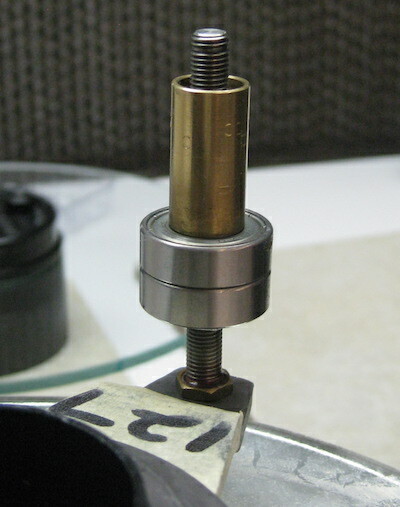 Since the rod doesn't go through the middle of the weight you can just loosen the locking screw and slide the weight off of either end of the rod while it is attached to the scope. Clever. The weight is 1kg. May 23rd. In the wise words of Proctor and Gamble: Lather, rinse, repeat. The goal for this evening was to basically do the same thing as last time. Do a bit of wet sanding with 320 grit paper, get everything re-masked, and then apply a coat or two of filling or building primer. 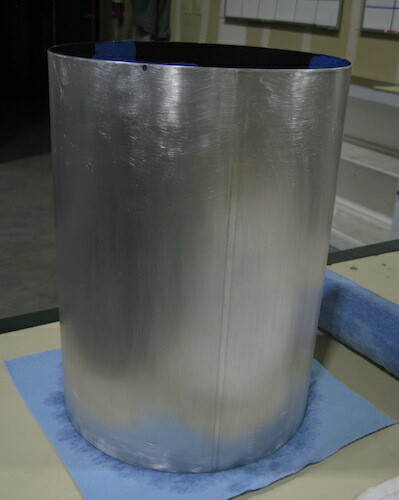 After sanding the first layer of the self-etching primer the tube was pretty smooth. 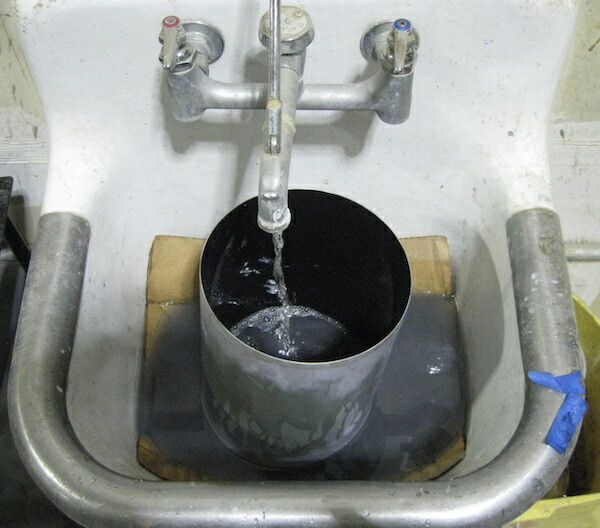 The filling primer is put on to fill up any micro-canyons in the surface. Everything went swimmingly. This filling primer is a little weird. It got all bumpy and rough by the time I was finished applying it. I suspect it will turn to powder when it is dry. There will be more sanding in the future anyway. I hung the tube up in the same place as last night. If everything goes well I should start putting on the white next time. Getting closer. 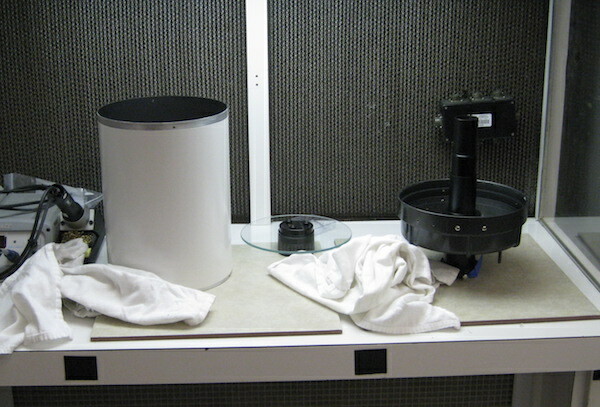 May 30: I moved the tube to my office and when I came back from the long Memorial Day weekend I smelled a lot of paint. I guess the filling primer was still curing. That seemed odd. I started thinking about using some heat, so I contacted my painting guru up in Idaho. He suggested using some UV rays to help things along. We've got all kinds of those in New Mexico. I built a rig out of some old laptop boxes and a stick of oak and hung the tube up on the back of my pickup for the afternoon. It made quite a difference. The paint thinner portion of the smell of the paint went away. By the end of the day it just smelled like old dusy grey paint. Interesting. Made a little "sun tea" while I was at it. May 31: Time to clean. I scrubbed off all of the excess filling primer with a small scrub brush. It was mostly powder. After that it was wet sanding with 400 and then 600 grit paper. 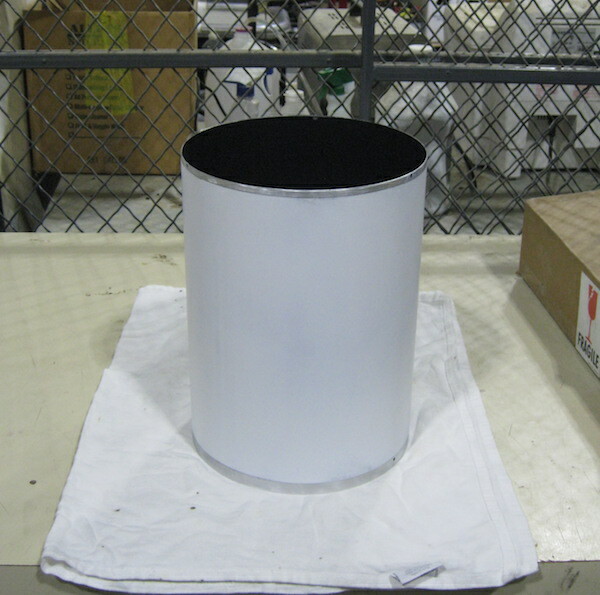 I also sanded on the black paint on the inside of the tube to help get it ready for touching up after the outside is finished. If that ever happens. This is kind of dragging on a bit, but I guess it's going about as fast as it can. After sanding the tube was as smooth as a certain part on a baby. Using the filling primer was interesting. You can see the vertical lines. That's the seam of the metal. 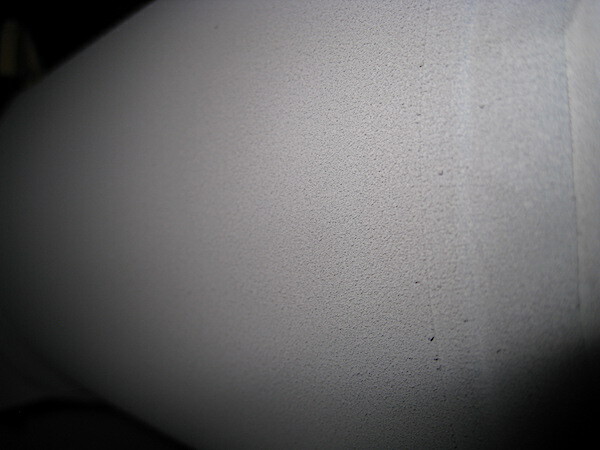 It was very easy to feel the seam before painting, but after it was barely there. Nice. First coat done. It came out a little rough in places -- like physically bumpy. 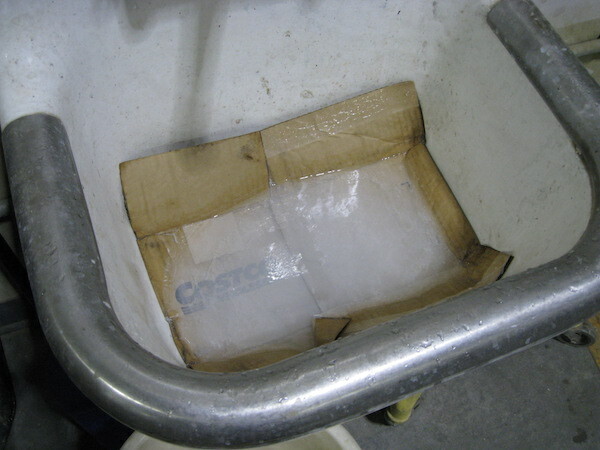 Think mixing sand into a can of paint and spreading it on the deck of a sailboat to make it a non-skid surface. That kind of bumpy. I think the paint semi-spat out of the can here and there. I'll let it dry for a couple of days, sand it and give it a second coat. Hope that turns out good. I want this scope back together. Done. Of course a couple pieces of stuff fell into the paint as it was drying, and, of course, it was a little too long after painting. Digging them out made a little mess. So after touching up those spots there are now a couple 'bad spots' in the paint, but they will just have to stay. I'm not going to do another coat. Maybe I'll cover the whole thing with glittery star stickers or something and hide them. With how well the first coat stood up to the amount of sanding I did I suspect a little old Celestron label isn't going to be pulling any of this paint off. This time there was no repeat of the bumpy paint. I put the spray can in the Sun and then in some hot water while I was getting things ready. I don't know if it prevented anything, but the paint was really flying out of the can with the increased pressure. It's a old bicycle painting trick I used a lot in the 1970's. 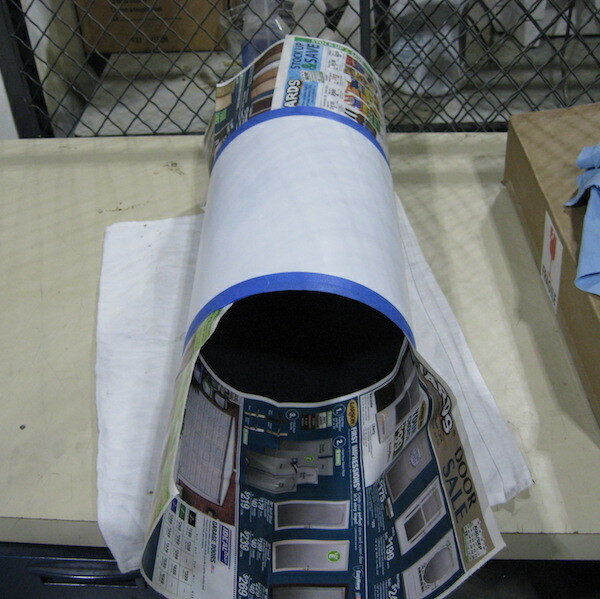 June 6: I wrapped up the tube in swaddling plastic 11-1/2" wide (the tube is 12" wide) and about 36" long. At that width I could put tape on the edges so that it would only touch the bare metal and not get on the white paint. Don't want pulling the tape off of the paint to cause anything bad. Been there. Done that. The wind was pretty calm so I was able to go outside put a good coat of the Rust-Oleum Chalk Board paint on the inside of the tube. It looks shiny in this picture, and if I were in the picture I would look a little scared, but it all settled down and got dull after just a few minutes of drying. Got it back in my office and put it on two sticks attached to my DeWalt telescope part holder and scroll saw for the night. It sure is dark inside there! 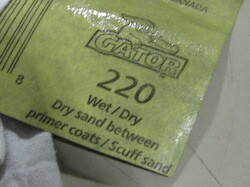 If this one coat looks good I'll -- finally -- start putting it all back together in a day or two. June 7: Rubbed down the inside with a towel and that got rid of the dust and stuff that fell into the black paint. Pulled off all of the masking tape. Looked good to me. Those bad spots in the white paint are going to bother me, but I'll just have to power through the psychosis. The scope will only be used at night, right? I'm probably the only one that will notice them. Time to put it all back together! June 8, Act III: Collected my parts and my wits and started in. We have an old clean table at work that's not all that clean, but the breeze coming from the fan keeps the sweating to a minimum and it's well lit. Something wasn't quite right with the focusing mechanism before I took the scope apart a month or two ago. There was a point where the knob would get hard to turn in each rotation. It was there throughout the range of mirror travel. Something was up. I first checked the brass tube and bearings that thread on to the brass threaded rod that actually moves the frame attached to the mirror. They were fine. There was no sticking there, and if the threads had been messed up the sticking would have only been for part of the travel. It had to be an alignment problem of some kind. I couldn't really take a picture of it, but maybe if you sqint a lot you can convince yourself that the rod is not coming straight out of the hole in the picture above. Just by eyeballing things I could tell that the threaded rod was crooked. I didn't want to remove the rod, because of the way it bolts on to the frame -- and it was still bolted on pretty good from last time -- so I developed a stiff upper lip and closed down the vice in the warehouse to a slot that the rod would fit in and persuaded the rod and/or the frame to bend just a little to get the rod perpendicular to the frame holding the mirror. It seemed to work. 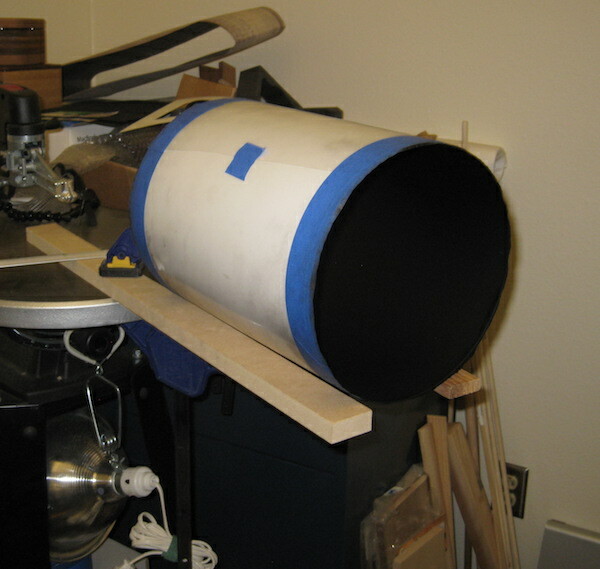 I greased up the outside of the baffle tube a little bit, slid the mirror and framework into place, got all of the focuser paraphernalia attached, ran the mirror all of the way to the back of the cell and used a little medium Loctite to hold the stop nut on the end of the brass rod. I put the mirror all of the way "in" to the cell to keep it out of the way of my greasy fingers for the next step. 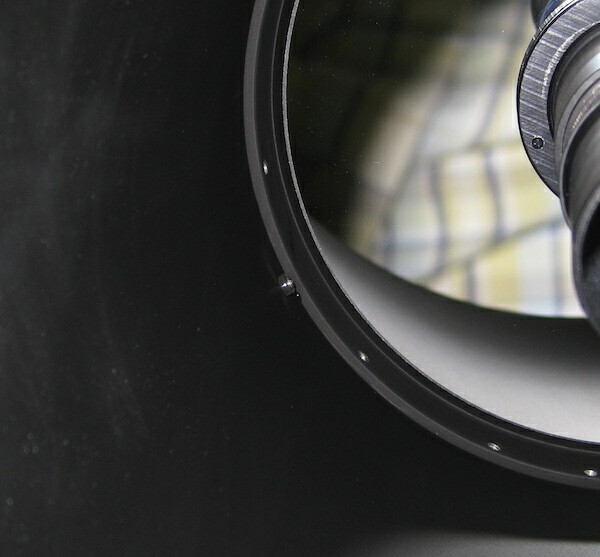 The whole telescope is only held together by five little nuts and bolts. It's kinda scary. There are two in the back and three in the front. Getting the little nuts on the bolts is a small adventure, and that's why I move the mirror all of the way back before starting. The ones in the back are a little hard to get to just beacuse they are way in there, and usually if you touch the black interior paint it leaves a white-ish mark. The ones in the front are tucked behind the lip where the corrector plate sits, so it's a little hard to see what is going on, and same thing with the black paint there. This time it was different. In addition to the nuts and bolts it looks like the old scopes also used a little glue or epoxy to keep the ends attached to the tube. My 1979 C8 had several large drops of epoxy between the outside of the tube, and the inside of the end pieces. This C8 had less, but I'm pretty sure that it had been taken apart by owners before. The 1979 one had never been taken apart until I did it this year. I put a small drop of Super Glue on either side of each of the five holes before sliding the tube into each end. I'll know that wasn't enough if the telescope all of a sudden splits in half. I'm not sure why I didn't think of this before, but this time I just put some scotch tape on the end of my finger with the sticky side out, stuck the nut to that and got it on the end of the bolt. Easy. Only a couple of these nuts needed a 1/4" wrench put on them to get the screw/bolt tight. 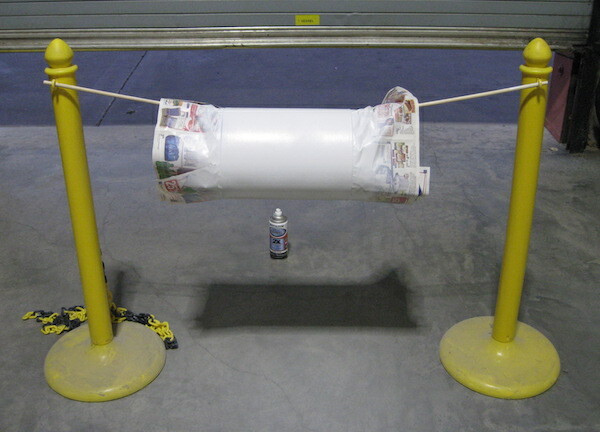 I think the curvature of the tube keeps the nuts from wanting to spin, so that makes things easier. 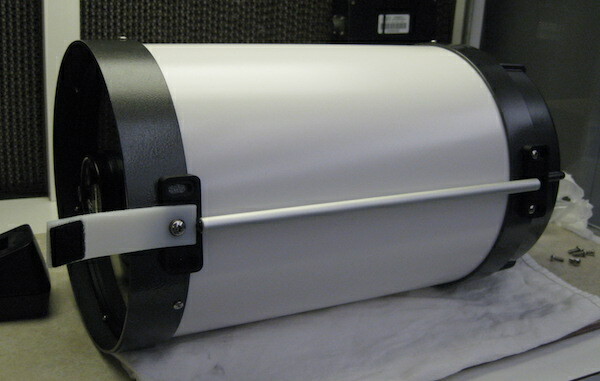 It's beginning to look a lot like a telescope! Once you get to this point you can take a breath. From this point on there won't be any additional junk falling into the scope for you to remove before finishing. Whatever is in there is in there, which also means whatever is in there is staying in there for you to look at. The corrector plate needs to be put back where it was both rotationally and up-down-right-left. Some C8s have small shims around the edges of the plate to get it postioned correctly. I noticed that when I dropped the plate into the front ring on this one everything was fitted so the plate couldn't move sideways. Nice. My 1979 C8 has paper shims that I need to get back into the right place. 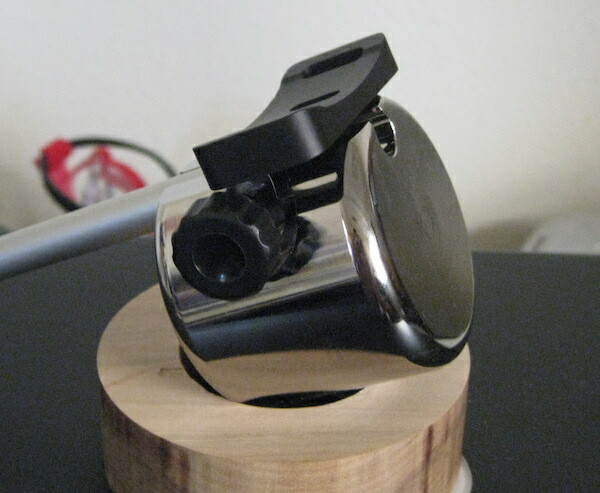 I didn't disassemble the secondary mirror holder, so no worries there. With all six screws holding the corrector in place it was time to add a couple of accessories. 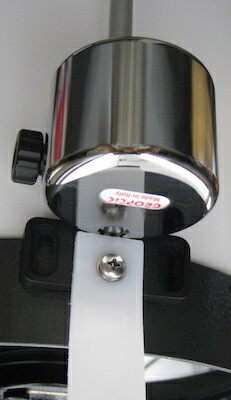 One was the shiny new counterweight system from Geoptik. I thought I would need to move my plastic tongue that keeps the tube from going completely vertical when stowed (see the last picture) and crashing into the azimuth/R.A. encoder in the middle of the forks, but I got a longer mounting screw and just included it where it had always been. It seemed to work OK. It won't be easily removable like it was before, but I don't think I'll need to remove it anyway. I'll just have to explain to every person on the planet what it is for. The other part was a Baader dovetail bracket for a finder. It's in the last picture below. 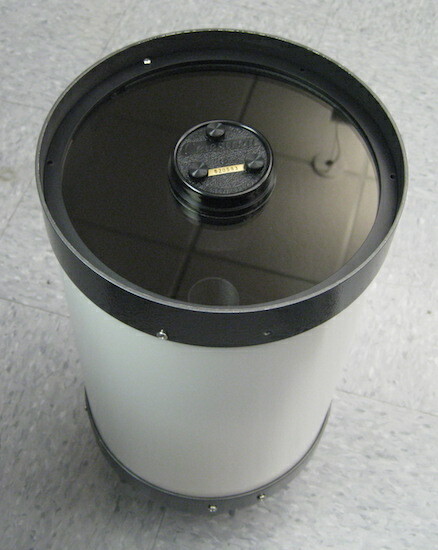 I will also add one of the simple L-shaped brackets for mounting a camera on top of the tube. I didn't have that part with me. Now all I had to do is get those two parts together without dropping anything or scratching anything up too badly. It's always a challenge. 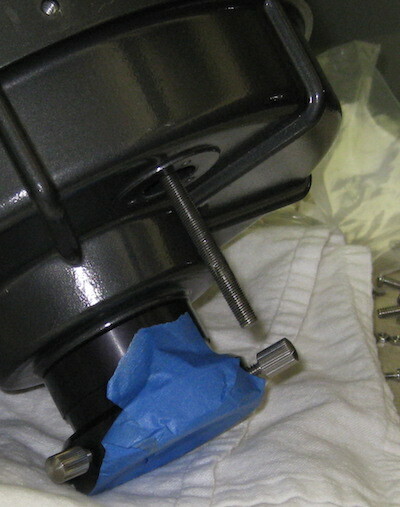 You have to loosen the bolts for one of the arms and spread them apart from each other something around 1/4". 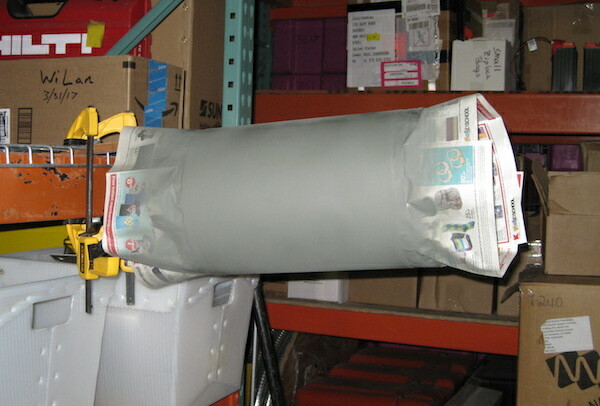 The tube can't be dropped down into the brackets that hold it, and if one of the arms is not loose you can't slide it in sideways, either. The wider apart the arms are the less the new paint that I just put on the tube(!) will get scratched. I locked the bracket with the slow motion declination adjustment in the "up" position and then used some gaffer's tape to keep the other one pointing up. The fewer the moving parts during this operation the better. Having that CAT to 2" adapter on the end of the scope has come in really handy. 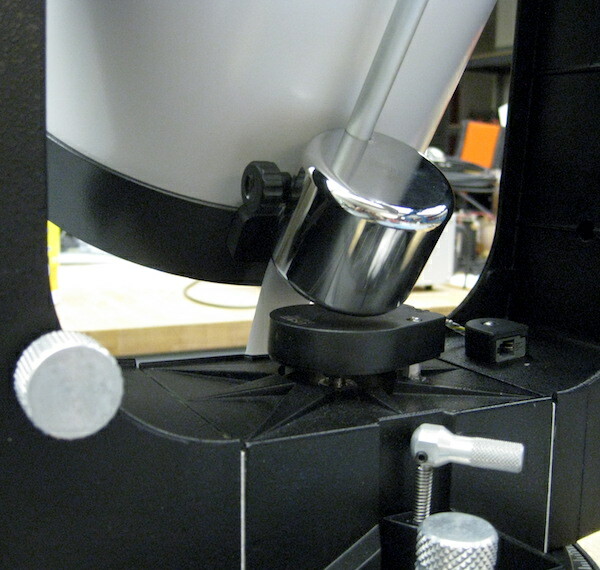 You can stand the whole telescope on it without having to worry about the focus knob getting crunched, and you can grab on to it and suspend the scope in the middle of the forks while you get some screws started. Once you get one screw going then things get much easier. 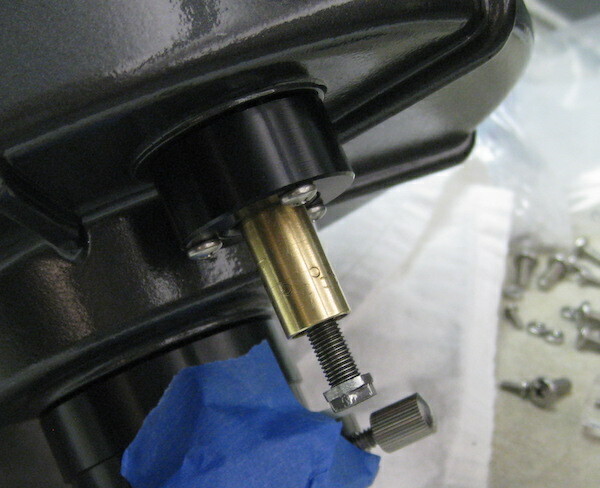 With all four mounting screws in place and the fork arm bolts re-tightened the OTA was officially attached to the mount. Just one more thing to do. I added the weight to the new counterweight system. 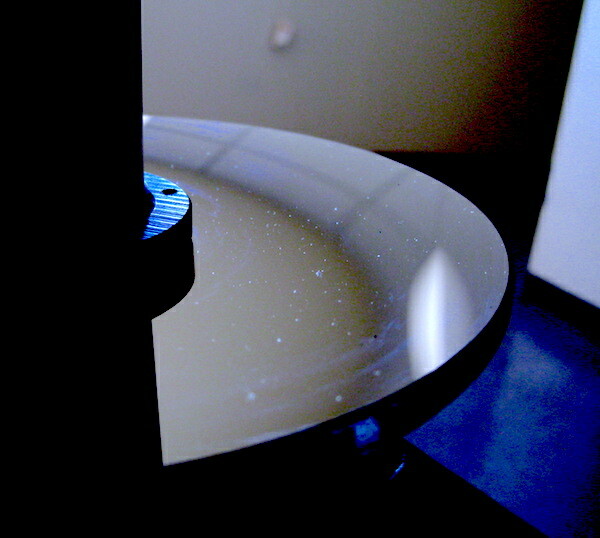 Very pretty, and it interacts well with the gravity, too. How is THAT for precision engineering!? Actually, I had no idea it would be that good. 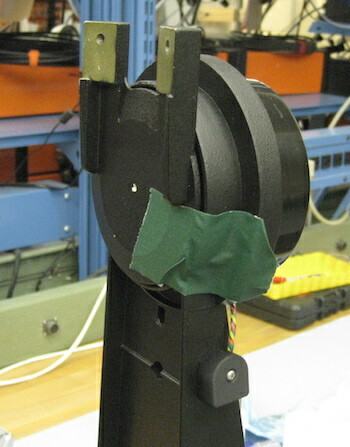 I thought that the weight might run into the encoder. 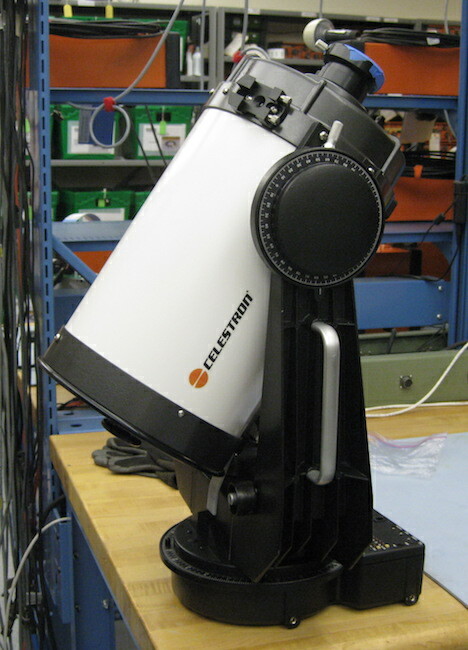 I was sure the original Celestron ones would. The mounting brackets for the rod are designed to let the weight slide off either end, but in this case the plastic tongue on the front of the tube kept the weight from going any further forward, so it all worked out perfectly! I thought I was going to have to remove the weight when putting the telescope away, but it doesn't look like I'll have to. And that's all she wrote. The project came full circle once I stuck one of the new and improved Celestron stickers on there that caused all of the trouble in the first place. It looks...better...doesn't it? Actually, it is a little crooked. I'll leave it for now. I'm pretty sure this one won't be able to rip this paint job off, but I don't really want to find out. If the wind doesn't go crazy around here I should be able to get it out under the stars this weekend and get everything collimated and whatnot. Then it will be ready for anything. I have a used proper heavy duty Ultima wedge coming for it. That will complete the Ultima tripod, wedge and fork set. 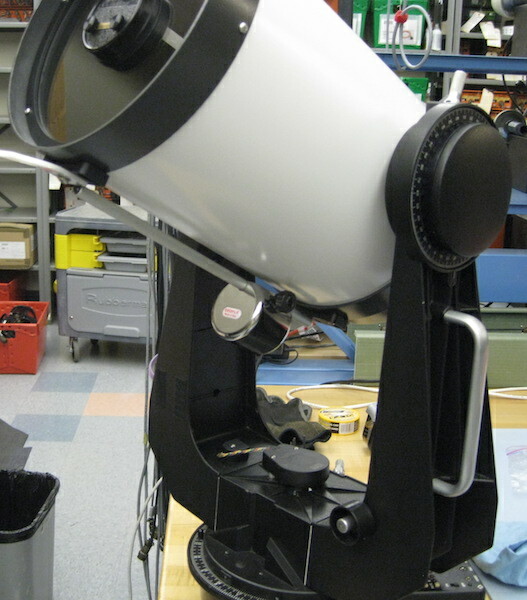 The scope is not an Ultima model, but it looks good anyway. A big thanks to a Mr. Telesonic on CloudyNights.com. It was his painting recipe that saved the day, and made it so just the third time was the charm and not the forth time.